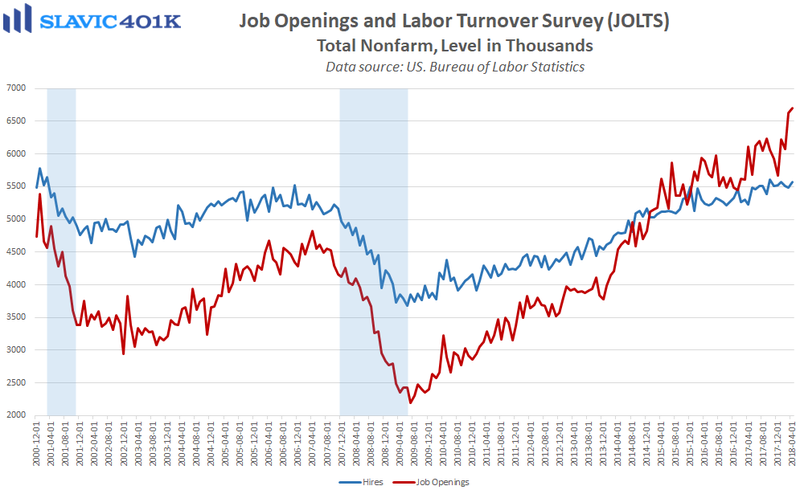 The latest job openings and labor turnover survey (JOLTS) from the Bureau of Labor Statistics (BLS) showed that there were 6.698 million job openings in America in April (lagged release). That was significantly better than expected and an all-time high. Most of the new vacancies in April were found in the manufacturing (+33,000) and information (+26,000) sectors, while job openings fell in the finance and insurance arena (-84,000). Total hires also rose in April to the highest levels since October, which together with the headline vacancies figure suggest that the economy continues to create jobs fast enough to absorb any remaining slack in the labor market. 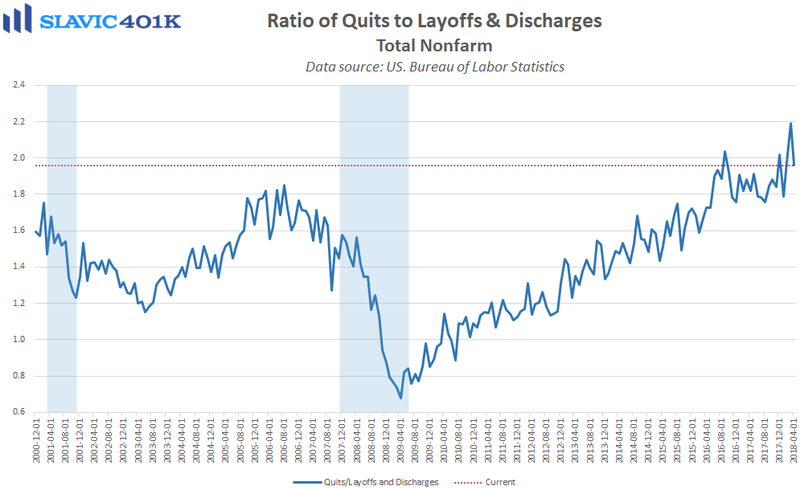 Elsewhere in the report, the ratio of quits to layoffs and discharges pulled back from March’s cycle high, and the number of unemployed Americans per job opening fell to 0.89. The latter implies that there are now more vacant positions in this country than there are adults looking for work. 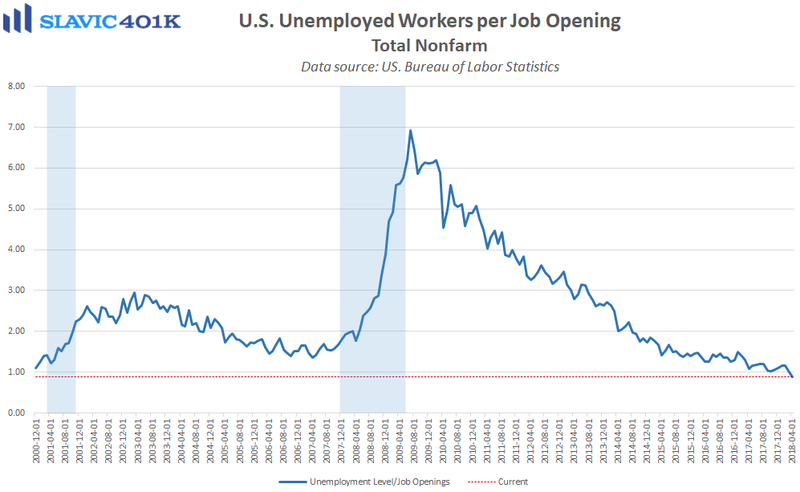 In fact, job openings exceeded the number of unemployed by 352,000 in April, and that gap likely widened in May since the latest payrolls report showed that the number of unemployed Americans fell to just 6.07 million last month, the lowest level since January 2001. 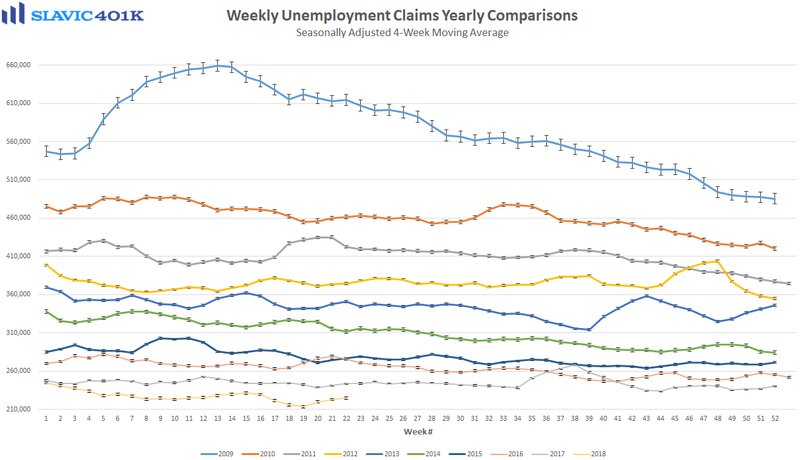 Moreover, data out this morning from the BLS showed that first-time claims for unemployment benefits totaled 222,000 last week. That is the 170th sub-300K print in a row for this leading economic indicator and therefore continues to signal no risk of an imminent recession. More importantly, all of the above-mentioned employment data provide more evidence of a tight labor market that should give workers increased bargaining power, and in turn put upward pressure on wages and inflation.